A finalist for Romance Writers of America’s prestigious Golden Heart Award, Chris Keniston is a USA Today bestselling author of several popular book series, from contemporary romance to women’s fiction to sweet and clean romance — all with happily endings. Her newest releases are Keeping Eileen, book 11 of the Farraday Country contemporary romance series set in cattle-ranching west Texas, and Flirting with Paradise, a novella in the “closed-door” Sweet Aloha Series in Hawaii. (The original Aloha Series offers steamier versions from this tropical setting.) Coming soon is Hart Land, a series centering on a lakeside small town, a retired Marine Corps general, his artistic wife and nine single granddaughters. Chris also partners with friends and bestselling authors Addison Cole, RaeAnne Thayne and Nancy Naigle in the new sweet world, Main Street Romance. Set in the fictional town of Romance, Virginia, the Main Street romances offer readers and fans a place to find HEA sweet stories. A native New Yorkier, Chris lives in suburban Dallas with her husband, two human children and two canine children, including a German Shepherd rescue. After all, even dogs deserve a happily ever after. 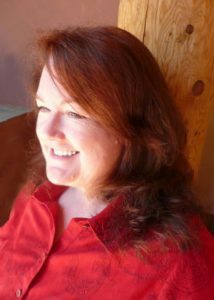 Host Patricia McLinn talks with Chris about past life experiences, location and how they play into the process of a “pantser” — one who writes by the seat of her pants (as opposed to a “plotter”).